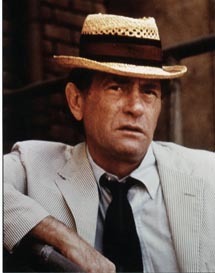 Darren McGavin had a long and prolific career in film, television and stage that spanned nearly sixty years. With a style both curmudgeonly and earnest, McGavin is always a watchable presence. Born in San Joaquin, California on May 7, 1922, McGavin eventually moved to New York City and trained at the famed Actors Studio, as well as the Neighborhood Playhouse. He made his big screen debut in an uncredited role as a student in 1945's A Song to Remember. There would be numerous bit parts throughout the '40s and 1950s. Among the more prominent, the actor appeared in Summertime, The Man With the Golden Arm and The Court-Martial of Billy Mitchell. In addition, work came fast and furious in television - where McGavin had the good fortune of acting in several episodes of Alfred Hitchcock Presents. It was in this medium that he would make his biggest mark. He was given the lead in Mike Hammer (which began its run in 1956) and also played Captain Holden in the Riverboat series from 1959-1961. Work was steady: Gunsmoke, Mission: Impossible, The Man From U.N.C.L.E., Love, American Style, The Rookies...too many programs to mention. In 1972, the actor first appeared in the role that would forever endear him to fans of the horror/fantasy genre. He played supernatural-obssessed reporter Carl Kolchack in The Night Stalker, produced by Dan Curtis and directed by John Llewellyn Moxey. When the Made-for-TV movie first aired, it was the highest rated television film up to that time. The teleplay (written by legendary Richard Matheson) concerned a modern day vampire in Las Vegas. With its nice mix of thrills and humor, the thriller struck a cord and a sequel was inevitable. The Night Strangler (directed by Curtis himself) made its debut a year later...and the story about a series of murders involving a killer who has found the secret to immortality was also a hit. Matheson once again supplied the script and McGavin gave another charming and winning performance as the smart-aleck Kolchak. In between the Night movies, McGavin starred in Something Evil with Sandy Dennis, directed by Steven Spielberg. And it should be noted that one of two pictures he directed, 1974's Happy Mother's Day, Love George (AKA Run, Stranger Run), was a quiet American gothic tale with slasher overtones ultimately underappreciated at the time. Meanwhile, the success of both Night movies led to a weekly series. Kolchak: The Night Stalker ran for only a single season (1974-75) but it made an impact with its fast pace, witty banter between McGavin and the cast (particularly Simon Oakland as stressed out Editor Tony Vincenzo), and more than a few frightening moments. McGavin passed away on February 25, 2006 - and while many announcements proclaimed "Star of A Christmas Story Dies," it is a testament to his legacy that he was known for so many varied roles. Yet for some, he'll always be remembered for that old hat, rumpled suit and tape recorder...chasing vampires, witches and assorted boogymen. "This guy, I've got him in my mind, see, he's fired from the New York Journal in 1955. That day, the day he was fired, he was wearing a seersucker suit, a black string tie and a white shirt with a button-down collar. So he's still wearing 'em. He hasn't bought a suit of clothes since he was fired. The truth of the matter is I love Kolchak. He's terrific. What he's saying to the world is beautiful - the heck with you, brother, I'll get my story anyway. He's a man in a million." So was Darren McGavin. Goodnight, Kolchak!